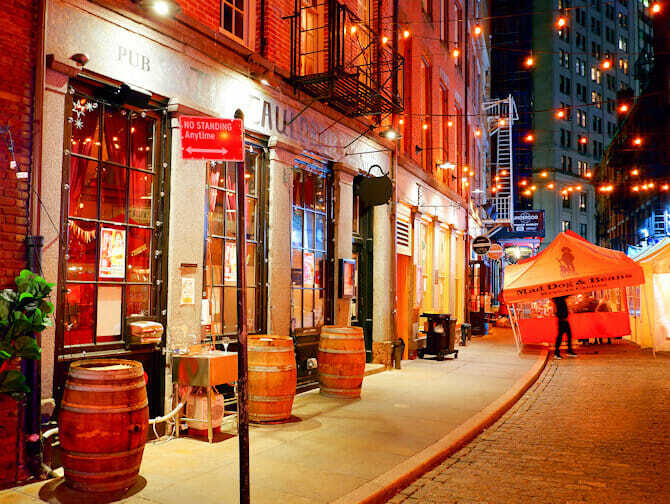 Eating at one of the Stone Street restaurants in New York is a unique experience. This culinary, pedestrianised cobblestone street located in the Financial District, Lower Manhattan has a completely different atmosphere compared to anywhere else in the city. It certainly contrasts greatly with Wall Street, which is situated right behind. Many people come to Stone Street’s cafes for drinks after work. It’s a perfect and idyllic spot for a terrace, and these places know it. In summertime, the whole street turns into one big terrace, full of large picnic tables. The atmosphere is relaxed and friendly: a good place for meeting people! Combine this all with the historical houses, their beautiful interiors and atmosphere, you can’t go wrong when dining on Stone Street. In this ‘craft beer’ cafe you’ll find the most unique draft beers. The menu is very varied and Growler even has its own house brew. You can easily substitute ‘bites and brews’ for ‘beer and burgers’, because the burgers in this place are state of the art. State of the art as in: the meat comes from grass-fed Kobe cows (for the experts) and melts in your mouth, the bun is a ‘pretzel brioche’. It’s $11 in total. You can also order the mini version: 5 sliders (small burgers) for $15. Do order a serving of fries, since that’s a bit different too: Korean-style for example, with beef and kimchi, or Canadian poutine: with cheese and gravy. For the streets best cocktails head to Underdog. Actually, it’s a blessing in disguise that this place exists at all. Hurricane Sandy damaged a lot of Stone Street and completely devastated Growler Bites and Brews’ party cellar. Instead of restoring it for its original purpose, they decided to create a cocktail bar. And it has become a great success. With a frequently changing menu full of original tasty cocktails, Underdog quickly rose to fame. 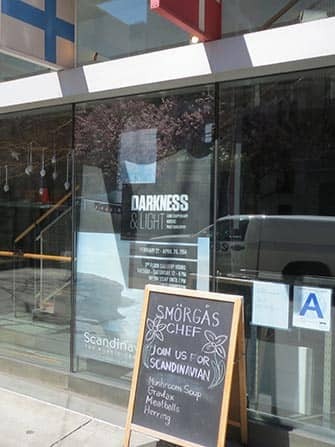 Now, this post is all about food and not about drinks, of course, but they do have a great menu full of bites to share. It features tasty sliders, mac & cheese and also special, more peculiar bites, such as cheese cake with bacon and cheddar, grilled cauliflower with raisins and pecorino or Hawaiian pineapple and papaya hotdogs with mustard. A nice touch: the music comes from a turntable. Pizza lovers will also enjoy themselves on Stone Street where Adrienne’s Pizza bar is a popular favourite. The term ‘pizza bar’ is actually a bit misleading because in addition to their great, wood fired pizzas, they also serve other Italian dishes, all very tasty, fresh and authentic. As for dessert, don’t forget to try a slice of their famous Nutella cake. It’s not a cheap place: for a Margarita pizza you’ll pay $17. Oysters and conviviality, that’s what it’s all about at Ulysses A Folk House. It’s not an oyster bar, but this is the very item on the menu people keep coming back for. They also organise an oyster festival each year in September. Above all, Ulysses is a cosy bar, with plenty of seats, where you can have drinks and eat something as well. Don’t go there if you want to grab a quick bite, because service can be slow. But what does it matter if you’ve plenty of time and you’re in such a nice place? They regularly have live music, adding to the already great atmosphere. The menu isn’t too special, but dishes are affordable and tasty in their simplicity.